You can always count on really Useful Boxes. We have lots of these ones and other sizes too. We love them. Holds a good amount and are strong. 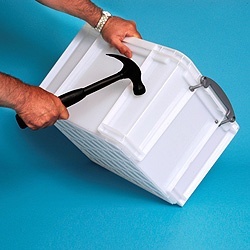 One of the best storage boxes there is, strong, durable and plenty of space. Rectangular in shape with no molded inner stabilisers (they are on the outside), when bought at the right price these represent tremendous value for money. 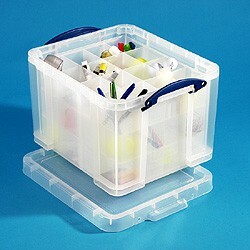 Bought alongside another Really Useful Box to use within a youth organisation to carry paperwork around. 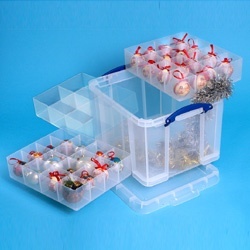 Perfect size, durable and easy to carry, nothing beats the Really Useful Box range in my opinion. Was looking for something sturdy to file away foolscap hanging folder with important documents. The sales assistant took time to show me all the different sizes available. Bingo! 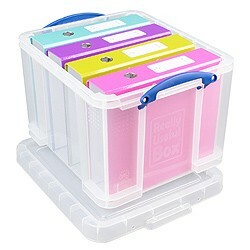 The right one just does the trick and contains every document which then can easily be stored away. I am sure once we finish with the documents this box will prove to have numerous other uses. Always adding to my collection of Really Useful boxes. 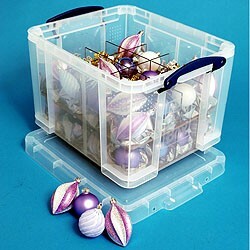 They make storage of so many items easy.